Gemstones that display special optical phenomena are known as phenomenal gems. The best known optical effects include asterism (the star effect), chatoyancy (the cat's eye effect) and color change. However, there are some additional optical effects that are of interest to gemologists and collectors: iridescence, aventurescence and adularescence. While some of these effects are more subtle, they are fascinating in their own right. Iridescence is a phenomenon caused by the difffraction of light, which results in the display of a multicolored surface. Iridescence can be observed in a number of gems: in pearls (where it is known as "orient"), and in fire agate, labradorite, and, the "color play" of precious opal. Aventurescence is result of reflection rather than the scattering of light. When plate-like inclusions of another mineral are present, and are of a highly reflective nature the gem sparkles and glitters. This effect is known as aventurescence. The term shiller is also used to describe this glittering effect. The most common reflectors are copper, hematite and mica inclusions. Adularescence is an intriguing floating light that appears to emanate from below the surface of the gem. The name "adularescence" comes from the historical name of for moonstone ("adularia"), the gemstone that exemplifies this phenomenon. In moonstone, adularescence is due to light entering into the crystalline structure and bouncing back and forth between layers creating an aura or shimmering quality. Crystals of moonstone consists of two types of intermixed feldspar -- sodium feldspar and potassium feldspar. These layers scatter light either equally in all spectral regions, producing a white shiller, or as in the most valuable specimens, in the blue color range. 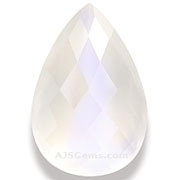 Moonstone is usually colorless but also is found with a silvery sheen and many colors like white, sky blue, pink and orange. Moonstones come in a variety of body colors, ranging from colorless to gray, brown, yellow, green, or pink. While the moonstones colors can be very attractive, it is its attribute of adularescence that most consumers find attractive. 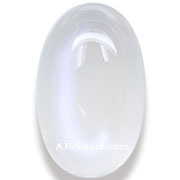 The best moonstone has a blue sheen, high clarity, and a white to colorless body color. 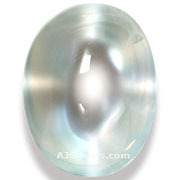 The rare and valued bluish, nearly transparent moonstones are most often found in Burma and Sri Lanka (Ceylon). There are also known deposits of moonstone in Australia, Brazil, Germany, India, Madagascar, Mexico, Norway, Switzerland, Tanzania and the United States.